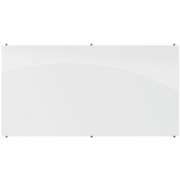 Shop Wall Mounted Whiteboards in a Great Selection of Sizes! 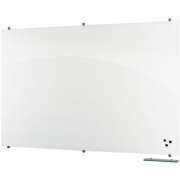 Wall mounted whiteboards are essential for classrooms and meeting spaces. They offer a great space for writing outlines and notes. What size whiteboard should you get for your space? The answer depends on many factors including what you are using the space for, how much writing you plan on doing and how many people are in the room on a regular basis. 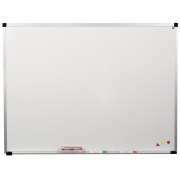 A larger dry erase board offers more space when you need it, and is always a good option if you have room for it. There are many options when it comes to materials and special features for your whiteboard. Surfaces come in resin, porcelain steel, glass and melamine. The right choice depends on your budget and how often your board is in use. 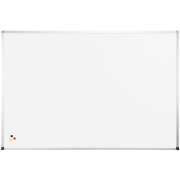 Make sure to look into all of the options before choosing your dry erase board so you can get the best choice for your purposes. What is the best place for a whiteboard? Wall-mounted whiteboards have become a must-have in modern classrooms. Teachers use them for notes, examples and assignments on a constant basis. Because they are always in use, they should ideally be centered on the wall in the front of the classroom. When used with colorful whiteboard markers, wall mount whiteboards are a wonderful educational tool which can help students follow along with materials and stay engaged throughout lessons. 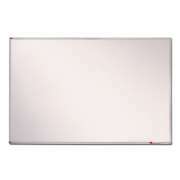 Dry erase boards are also a popular choice for meeting spaces and boardrooms. It is always helpful to have a place to jot down the agenda or brainstorm new ideas. It might even be a good idea to get more than one whiteboard so you have multiple arrangement options or separate spaces to write for various purposes. What is the best material for a whiteboard? 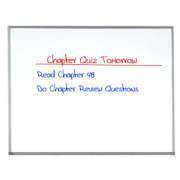 There are a number of choices when it comes to the surface material for a white board. 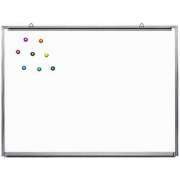 A magnetic surface is convenient because it allows you to hang papers on the board and easily remove and replace them. Many materials are designed specifically to minimize or eliminate ghosting and staining. A whiteboard that is hard to erase wastes precious time and is hard to read as well, so it is important to consider material and quality. Once you decide which features are important to you, it is time to choose a material. Glass whiteboards are highly durable, modern and easy to clean. They have no ghosting or staining when used with dry erase markers. These qualities make them a great option for professional settings such as boardrooms and other meeting spaces where appearance is important. Melamine is the most budget-friendly option but it is not as resistant to stains and ghosting as other surface materials are. Porcelain steel is magnetic and highly durable, making it a great option for classrooms and other spaces where whiteboards are used on a constant basis. When the budget allows, other options are preferable. 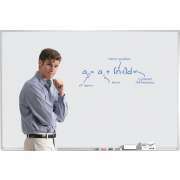 If you plan on projecting onto your wall mount dry erase board, a low-gloss surface is preferable. What do I need on a whiteboard? There are lots of extra features that will make a difference when you are using a whiteboard. A marker tray is convenient because it keeps your writing implements and eraser handy and you don’t have to worry about markers rolling away. Some models come with a tackable map rail which is helpful in a geography classroom and for other subjects that sometimes require posters. When considering the issue of price, it is a good idea to look at the extra items that come with some wall mounted whiteboards including markers, magnets, erasers and more. Beyond the variety of options when it comes to multipurpose models, there are a number of specialty models available as well. Whiteboard cabinets are often the preference in professional settings. With a bulletin board on the outside and a dry erase board in the inside, they serve a number of purposes. When a writing surface is not needed, the cork board offers an excellent space for hanging important announcements and lists. What kind of whiteboard is best for a school music room? Music whiteboards are designed for group practice spaces and classrooms. 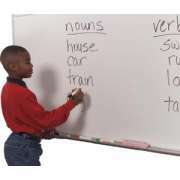 With black lines permanently printed on the board, teachers save time when they want to write out a certain part of a piece for the whole class to see. Wall-mounted boards are ideal for the music classroom because they stay right where you need them and prevent teachers of other subjects from moving them around. When it comes to wall mounted whiteboards, Hertz Furniture can help you find a great fit for a space of any size. No matter how you want to arrange your room or what kind of furniture you are coordinating with, we will help you get the best choice for your classroom or conference room. Now that you know all of the important things to consider, making the right choice will be much easier.